Interesting facts, trivia and tips about the Georgia Peach. 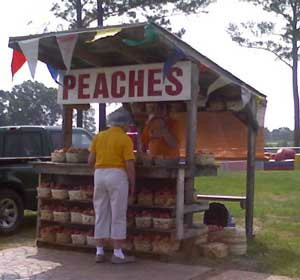 The Georgia Peach Festival is an annual event in Peach County with events scheduled in Byron and Fort Valley. Georgia's peach industry is concentrated in Crawford, Peach, Taylor and Macon counties. There are two commercial peach-growing regions in Georgia. The central region produces approximately 83 percent of the state's production. The southern region produces approximately 17 percent of the state's harvest. Fresh Georgia peaches are available only 16 weeks each year, from mid-May to August. Georgia produces more than 40 commercial varieties of peaches, which are divided into general categories - freestone, semi-free and clingstone. The peach is a member of the rose family and should have a pleasingly sweet fragrance. You should never squeeze peaches; they bruise easily. When buying Georgia peaches look for a creamy gold to yellow under-color. The red or "blush" is an indication of variety rather than ripeness. The crease should be well defined and run from the stem end of the peach to the point. A peach should smell "peachy." A peach should be soft to the touch. The grounds of the former Berckmans Nursery, also known as Fruitland Nursery, in Augusta, Ga., is now the site of the Augusta National Golf Club, home to the annual Masters Tournament. The old manor house is now the famous Augusta National Clubhouse seen so often on tv. Peach production in Georgia reached an all-time high of almost 8 million bushels in 1928. Since then, production has decreased to approximately 2.6 million bushels annually. Franciscan monks introduced peaches to St. Simons and Cumberland Islands along Georgia's coast in 1571. By the mid-1700s, peaches and plums were cultivated by the Cherokee Indians. 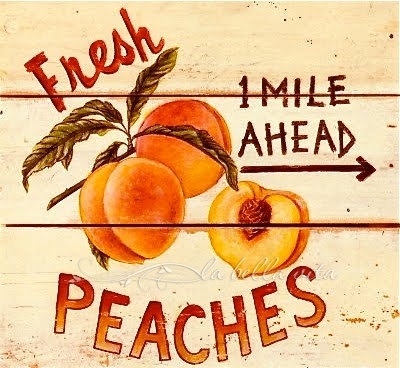 The first peaches were planted in Georgia in the 18th century. The first commercial production did not occur until the mid-19th century. Raphael Moses, a planter and Confederate officer from Columbus, was among the first to market peaches within Georgia in 1851 and is credited with being the first to ship and sell peaches successfully outside the South. The first Georgia peaches were shipped to the New York market between 1858 and 1860. In 1870, Samuel H. Rumph, a Marshallville, Ga., peach grower, perfected a new peach variety, which he named Elberta, for his wife. The Elberta remained the leading peach in Georgia until 1960, but was replaced by newer varieties created for commercial use.